The B&ES (Building & Engineering Services Association) Yorkshire Region has made a £2,000 donation to the Sailfree charity at Otley Sailing Club. Operating as part of Sailability, the charitable arm of the Royal Yachting Association, Sailfree provides around 1,000 sailing sessions every year to people with all types of disabilities and illnesses , allowing them to experience a level of freedom and independence they do not normally enjoy. 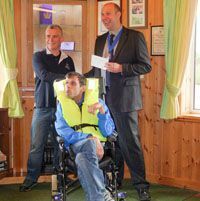 The B&ES donation was raised during the Yorkshire Region's annual Charity Ball and Training Awards evening, which took place at the Cedar Court Hotel, Bradford -and was presented to Otley Sailing Club commodore Paul Karran, by regional chairman Daniel Ball of Imtech Engineering Services.